Vacation rental townhouse. Sleeps 4, 2 bedrooms, 1.75 bathrooms. Dogs allowed. Outside of Alpine Village 78. Back deck of Alpine Village 78. View from the back deck of Alipine Village 78. Living room with flat-screen TV and an Ipod stereo. Living room with flat screen television and wood burning fireplace. Dining area with seating for six. Kitchen with microwave and dishwasher. Master Bedroom with queen bed and air conditioning. Second bedroom with two twin beds, small tv/vhs and air conditioning. 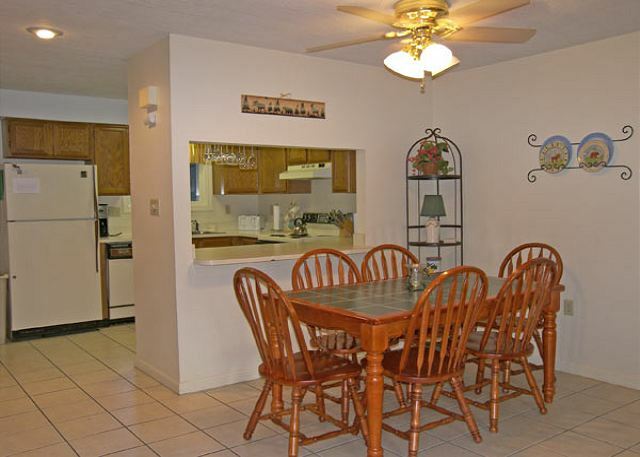 A comfortable two bedroom, 1 3/4 bath townhouse at Alpine Village Resort. Enter to the open concept living , dining and kitchen area with attached 3/4 bath. Enjoy the flat screen television with DVD/VHS. The back deck and lovely common yard space is accessed from the back door in the kitchen. Upstairs you will find two bedrooms and a full spacious bath. The master bedroom has a queen size bed and air conditioning. The second bedroom has two twin beds and air conditioning. Alpine Village Resort is located close to downtown North Woodstock. North Woodstock offers great dining opportunities including local favorites like the Woodstock Station & Brewery, Truant’s Tavern and the Cascade Coffee House. Locally you will find plenty of seasonal and year-round activities to fill your time including shopping, golfing, mini-golfing, amusement parks (including a local waterpark), gondola / tram rides, natural attractions, alpine skiing and snowboarding, nordic skiing, snowshoeing, hiking, mountain biking, river swimming (Cascade Park is just a walk away), kayaking, bird watching and much more. Dogs are welcome, $25 fee per dog. No more than two dogs allowed. Please note: Alpine Village Townhouses have only one allotted parking space. We really enjoyed our stay at Alpine Village. We have stayed there before but this condo was much nicer. It was well stocked. The air conditioners worked very well. The appliances were like new. Our unit was dog friendly and there were dog hairs all over the couch. But other than that, I would definitely return. The property was located very close to Lincoln NH. 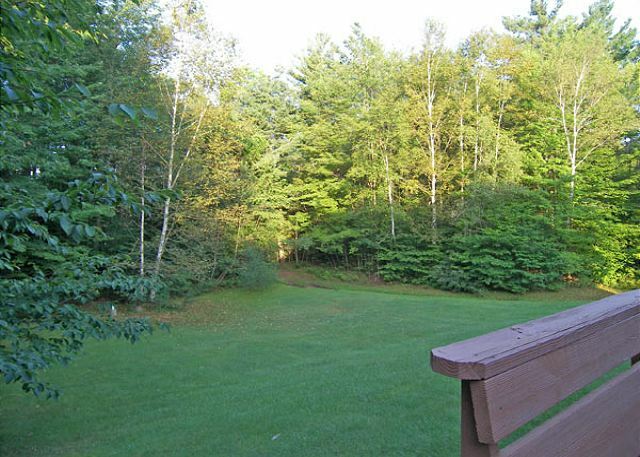 It has a nice backyard facing natural forest. With the exception of a broken dishwasher, everything else worked very well and we enjoyed being there a lot. It was fantastic! My fiancé and my dog stayed here for a weekend and had a blast. The condo was clean and it's great that they accommodate dogs. We cooked a lot so we never left. Very relaxing, and this is our third year staying here. Have stayed in this unit several times over the years. The unit has been maintained and is in good condition. My only complaint is that the bedding,in the master, needs to be replaced. Thanks for your helpful comment. Glad that you enjoyed the home and your stay! We're glad that you enjoyed this pet-friendly home, though not the hair. We performed a full spring clean just after your stay, so that should be resolved now. Excellent experience all around. Condo was in great condition and well stocked. We had a great weekend! Great to hear that you had an excellent experience! It was nice to be able to stay in a home away from home. My family was able to be together or choose to do things separately if needed. We enjoyed our stay. We're happy that you were able to enjoy your home-away-from-home for this fun event! Our stay was very enjoyable. The unit is homey, comfortable, inviting and relaxing after a fun day at the slopes. This was our second stay at Alpine Village Resort (2009 at other unit) and we look forward to be there again in the future. The only disappointment was that the shuttle was not running that week as we were told it would be, rending the transportation passes worthless and affecting the overall planning. Thank you. We're glad you visisted us again and enjoyed your home. We're sorry for any confusion about the shuttle service. Like most resorts, Alpine Village's shuttle runs weekends and holidays only. Wonderful, clean, comfortable property. Only complaint was couch needed a little more vacuuming, came home with a lot of white dog hair! Everything we needed was there. Very clean. Comfortable beds. lovely back porch with a view of green woods to relax. And the shower pressure was like a friendly massage at the end of a long day. Perfect. Aso in close proximity to places to eat and shop. Thank you!